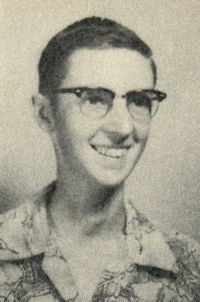 Obituary – Box, Jr. – William Alton « Perry High School Alumni Association, Inc.
Student Council 50-51; 53-54; F.F.A. 50-54; Band 50-54; Boy’s State 52-53; Football Queen Manager 52-53; All School Revue 52-53; Annual Staff 52-53; Class Assemblies. Bill Box Jr., 51, 617 Locust street, died at 4 p.m. Thursday at Presbyterian hospital at Oklahoma City. Funeral will be at 10 a.m. Tuesday at the First Presbyterian church. Rev. Jim Dunkin, pastor, will officiate. Burial will be at Grace Hill cemetery under direction of Brown Funeral home. The casket will not be open at the service. Memorials may be made to Oklahoma Medical Research Foundation. Box was born July 8, 1936, at Abilene, Texas, the son of Bill and Ethel Box. He came with his family to the local community in 1938. Box was a graduate of Perry high school and Oklahoma State university. He and Dalann Parker were married April 20, 1973. Box was an employee of Charles Machine Works until retiring in November, 1987, due to ill health. He was active in the Noble County Family YMCA and was affiliated with the First Presbyterian church. Among survivors are two daughters, Maria Lynn Zoellner, Stillwater; and Donna Jean Box, Enid; a son, Brandon Box, of the home; and a brother, Ken Box, Perry.